Centrepiece of Sunderland’s new bridge in the north-east of England has been transported to final location in middle of River Wear. On KAMAG`s K24 the 100m long A-frame pylon has been loaded from the production yard in Belgium to the port of Ghent. 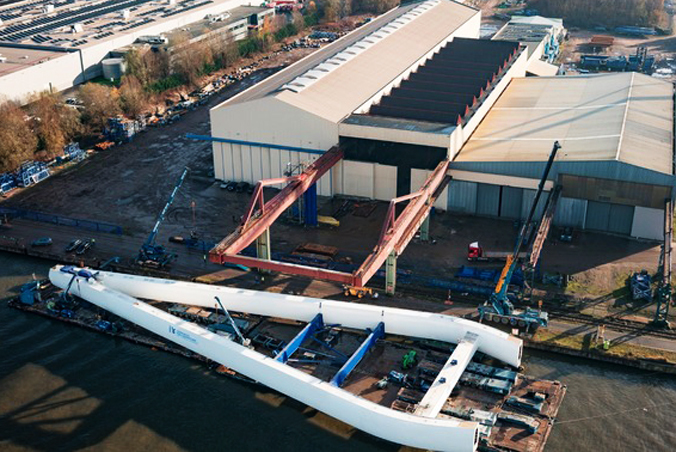 Made with more than 1,000 tonnes of steel and 550 tonnes of concrete, the structure is so big that the final stages of the fabrication process had to be completed in the open air, and it had to be loaded onto two barges before it could be transported along the canal to the port. Loads up to 15,000 tonnes are no longer uncommon. Depending on the weight of the sections to be transported, customized transporter combinations can be configured which precisely match customer requirements.